On October 1, 1917, chemist Charles Wilderman Trigg (1898-1989), wrote in his laboratory notebook at the Mellon Institute, “fellowship renewed for one year, main work to be on soluble coffee, all attentions to be centered thereon, new pressure absorption proves to be thoroughly tried out.” Trigg studied the difference in coffees, examining aromas, roasting conditions, flavor, and the removal process of caffeine from coffee at the Mellon Institute of Industrial Research where he was a research fellow from 1916 to 1920. 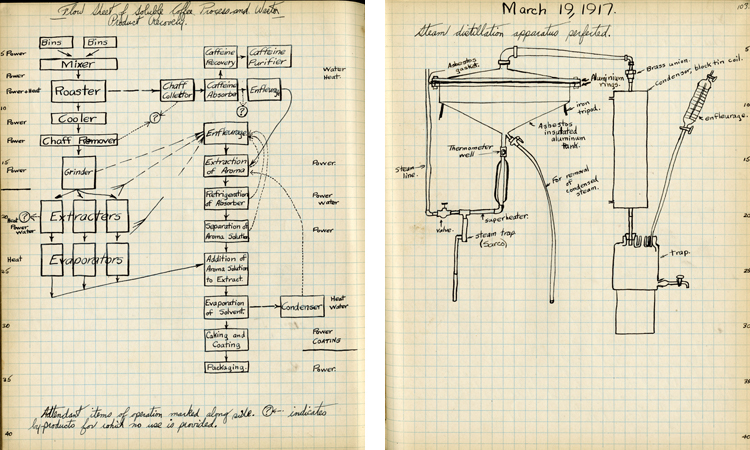 Laboratory notebooks, such as this example from Trigg’s personal papers, are a significant part of the invention record, providing insight into how innovative ideas take shape, from initial idea to concrete result. Because inventors understand that the priority of an invention may determine patent rights, writing often plays a significant role in documenting the invention process. Inventors record new ideas and have them signed by witnesses, jot down details of the progress of their work, and record their personal reflections. Trigg was no exception. He maintained meticulous notebooks, eight in total, all related to his laboratory research about coffee. On the left: Flow sheet of soluble coffee process and waste product recovery, notebook page 81, February 1917. 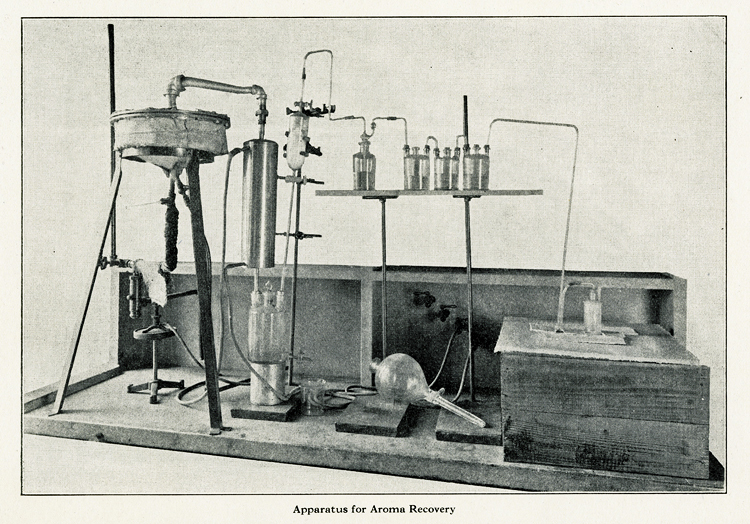 On the right: Sketch of steam distillation apparatus perfected, notebook, page 103, March 19, 1917. Both are from the Charles W. Trigg Papers, AC0411-0000004 and AC0411-0000005, respectively. Trigg’s study of coffee was not accidental and it certainly wasn’t instant. In his notebooks you can almost smell and taste the coffee. They are filled with detailed descriptions, calculations, sketches, testing data, and bibliographic and patent data related to his work on coffee technology, especially soluble, or “instant” coffee. One result of Trigg’s work was a patent for “a method of making water-soluble coffee extract and the product, (US Patent 1,367,715) in 1921. The first to bring an instant coffee to market was chemist Satori Kato (US Patent 735,777) in 1903. Kato’s soluble coffee was introduced to the public at the Pan-American Exposition in 1901 and assigned to the Kato Coffee Company. Behind Trigg’s research was John E. King (b. 1879), a coffee and tea merchant of Detroit. King established the John E. King Coffee Company, a wholesale business, and the King Coffee Products Corporation (1920), with a laboratory to conduct research and manufacture. King experimented with the idea of soluble coffee beginning in 1906 and to further his research, established a fellowship at the Mellon Institute of Industrial Research in Pittsburgh which Trigg was awarded. Trigg later became the chief chemist for King Coffee Products Corporation. According to the September 1921 Western Druggist, with Minute Coffee, “the housewife only needs to pour hot water on the powder. The dissolving process is instantaneous. No work, no bother, no grounds, no utensils to scour.” King promoted the convenience aspects of Minute Coffee, rendering the coffee pot and percolator obsolete, and freeing women in the kitchen. While developing Minute Coffee, Coffee-Pep was discovered, a non-alcoholic coffee beverage sold as a soft drink at soda fountains or for home consumption. Soluble in cold water, the coffee grounds were marketed essentially as a “man’s drink.” King trademarked Coffee-Pep in 1920 (US Trademark 133, 317). Both Minute Coffee and Coffee-Pep were discontinued by 1928. Trigg’s coffee research lasted four years before he moved on to other work, namely as an educator and mathematician, devising and solving challenging mathematical problems and writing Mathematical Quickies 270 Stimulating Problems with Solutions (1967). As if coffee wasn't enough of a stimulant, Trigg focused on math. There is no evidence that Trigg was a coffee drinker, but I'd like to think that he enjoyed a cup now and then. To learn more about the Charles W. Trigg Papers and other coffee-related collections, visit the Archives Center. Industrial Fellowships of the Mellon Institute. Science, Volume 49, May 16, 1919. Tea and Coffee Trade Journal, 1922. The Western Druggist, September 1921. Tea and Coffee Trade Journal, Volume 38, June 1920. Ukers, William H. All About Coffee. New York: Burr Printing House, 1935.